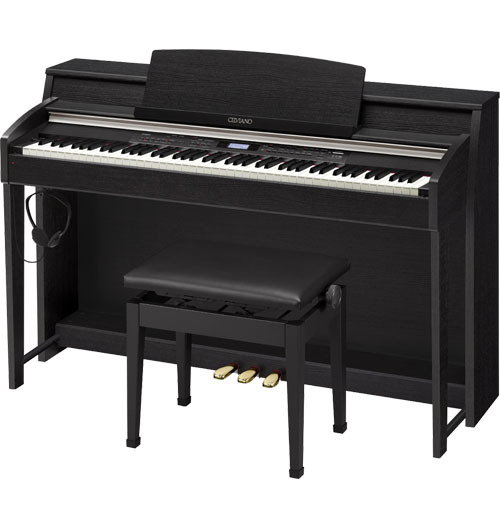 Experience the elegant design and rich resonance of the AP-620 Casio Celviano piano. The Celviano line of pianos has been refined for those who demand an authentic grand piano experience. The new AP-620’s traditional design houses new stereo grand piano sounds and enhanced “Ivory Touch” keyboard. Utilizing a new tri-sensor spring-less 88 note scaled hammer action, every nuance and detail of your performance is captured. A new 4 layer stereo grand piano sound delivers a natural, expressive and dynamic piano experience. The AP-620 features amazing 250 built-in tones along with full accompaniment and 180 rhythms. It has advanced features which include an LCD display, 16 track recorder, built-in SD card storage and registration memory to instantly recall splits, layers and rhythms at an instant. The AP-620 has dual headphone outputs, but also includes a powerful 30W per side speaker system which will deliver sound throughout your home. With 128 notes of polyphony, USB MIDI, Duet Mode, 1/4” audio outputs and more, Celviano’s advanced technology and sound will make the AP-620 the perfect addition to any home. Truly shines with its high-quality sound and design The CELVIANO AP-620 model truly shines with its high-quality sound and design. 180 preset rhythms offer a varied range spanning the world of music. With the sequencer (17 track/5 song), you can record your own ideas quickly and easily in real-time (capacity: 10,000 notes). Faster access: You can file up to 96 set-ups (8 x 12 spaces) in the registration memory. Piano sound tailored to your own taste: The piano setting key switches to grand piano sound at the touch of a button. Two settings are available: “classic” for a soft, discreet sound and “modern” with a more lighter, brighter character. The piano digitally reproduces the high-quality sound of a top concert grand piano complete with first-class reverb effects. The simulation of the resonating strings that is provided by the “Acoustic Resonance” CASIO effect rounds the sound experience off perfectly. Listen, sing along, play along: 60 top quality songs are stored. Retain an overview: The LC display provides you with easy access to the instrument’s functions. Ideal for lessons: the new duet functions allows teachers and pupils to play parallel to each other. The piano can be divided into two keyboard areas, which can be transposed individually. The piano features a 3-pedal unit with expanded damper capability. Impressive sound: The powerful two-way system with four speakers and 2 x 30 watts of output power ensures an exhilarating sound delivery. The sound is not only projected in the direction of the player but also to the rear or downwards, depending on the model. This creates a three-dimensional and more natural sound. The innovative SD memory medium offers a simple but limitless way to expand the internal song memory. The USB/MIDI–(GM) connection enables further Midfile songs to be loaded into the internal memory via the "Song expansion". No software installation from a CD-ROM required thanks to Plug & Play and the USB driver is compatible with both Mac and Windows (from Mac OSX 10.03 and Windows XP/Vista). The “Music Preset Library” contains 300 “one touch settings” based on popular rock and pop songs. The useful pre-settings for rhythm, tone, tempo, effects etc. makes time-consuming searches for the right settings a thing of the past. This assistant makes playing the “top 300” child’s play! Pop rhythm with a touch of jazz, jazz rhythm with a shot of pop: with the rhythm editor, elements from different rhythms can be combined and edited. 10 user slots are available for individual style editing.